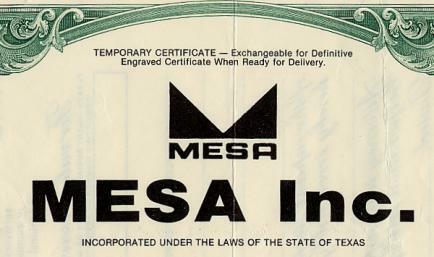 Beautifully engraved certificate from Mesa Inc issued in 1992. This historic document was printed by the American Banknote Company and has an ornate border around it with a vignette of men in an oil field. This item has the printed signatures of the Company’s President and Chairman of the Board (T. Boone Pickens). Light folds from original mailing. Mesa Petroleum, also known as Mesa, Inc., the nation's largest independent producer of domestic oil and gas and one of its largest gas producers, is a publicly held corporation with headquarters in Dallas and offices in Amarillo, Fort Worth, and Las Colinas. (Independent operators are distinguished from major oil companies primarily by their smaller size and lack of vertical integration.) It was founded by Thomas Boone Pickens, the son of a landman, a person whose job is to find landowners willing to lease mineral rights and then sell their leases to oil companies. Pickens was born on May 22, 1928, in Holdenville, Oklahoma, moved to Amarillo while in high school, attended Texas A&M for a year, and received his geology degree from Oklahoma A&M in 1951. After working as a roughneck and in a refinery, he became a geologist for Phillips Petroleum, but difficulties in dealing with company bureaucracy forced him to resign in 1954 and start out on his own. For two years Pickens was self-employed in well-site and consulting work. He founded the company that became Mesa Petroleum in 1956, when he entered into a partnership known as Petroleum Exploration, Incorporated, with Eugene McCartt and John O'Brien, his wife's uncle. McCartt and O'Brien owned quarter interests and supplied a line of credit that enabled work on bigger ventures, while Pickens owned the remaining half and served as president. In its early deals, PEI made money by selling prospects it had discovered and retaining a "back-in interest" or percentage of the profits made by the well in its first few years. Eventually, the firm attracted a group of Amarillo investors who allowed it to drill its own wells, and in 1958 PEI discovered eight gas and one oil well in sixteen tries. In 1959, with the help of PEI investors, Pickens formed Altair Oil and Gas Company to explore for oil in Canada, once again serving as president and major stockholder. In 1960 the company acquired a Utah mining company, Standard Gilsonite, and in 1962 PEI drilled ninety-eight successful wells and made more than $750,000 in profits. Company employees increased from two to twenty-three, and investors to nearly 300. BIBLIOGRAPHY: T. Boone Pickens, Boone (Boston: Houghton Mifflin, 1987). Vertical Files, Barker Texas History Center, University of Texas at Austin (Mesa Petroleum, T. Boone Pickens). 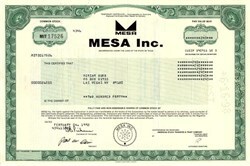 "MESA PETROLEUM CORPORATION." The Handbook of Texas Online. [Accessed Thu Mar 21 7:50:15 US/Central 2002 ]. Mesa Petroleum Inc., founded in 1964 by former Phillips Petroleum geologist T. Boone Pickens, garnered most of that attention. By the early 1980s, the company ranked as the top natural gas producer in the U.S. It quickly expanded into offshore exploration and acquired foreign drilling rights. When oil and natural gas prices plateaued and drilling prospects became expensive to find in the field, Pickens set out to acquire a cheaper source of natural gas and oil other companies whose stocks were undervalued on Wall Street. Pickens moves on such companies as Occidental Petroleum Co. and Phillips made him a darling on Wall Street, which loved his calls for top management to take care of shareholder interests rather than concentrating on management perks. The bloom on Pickens' rose faded though with the bust at the end of the 1980s. The price of natural gas faltered and left the company with a pile of debt that led it to merge in 1997 with Parker & Parsley Petroleum Co. to form Pioneer Natural Resources Co., operator today of the Fain gas plant north of Amarillo that still supplies the city with natural gas. With total proved reserves equivalent to 3.8 trillion cubic feet of natural gas or 628 million barrels of oil and with a reserves-to-production ratio of 14 years, Pioneer’s production is among the industry’s most stable. Contributing to this stability, Pioneer's three domestic core properties - the Hugoton and West Panhandle gas fields and the Spraberry oil and natural gas field - represent 67% of the Company's total reserve base.